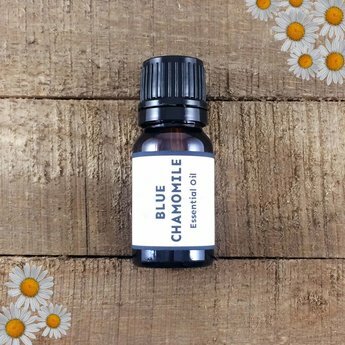 Our Blue Chamomile (Matricaria recutita) essential oil is a blue to greenish blue liquid displaying a sweet, herbaceous bouquet with a warm fruity yet spicy undertone. This calming yet mood uplifting oil can also improve digestion, reduce inflammation and cramping. Diffuser: Chamomile is great to add to a diffuser to promote relaxation (combine with mandarin and lavender). Make sure you are not allergic to chamomile first before applying all over the skin. Apply straight to an insect bite or bee sting to relive pain and inflammation. Fun facts: chamomile contains a constituent called azulene which forms when the plant is distilled making the essential oil blue. Azulene has been found to be an excellent anti-inflammatory agent. Cautions: known as non-toxic, non-irritant and non-sensitizing.